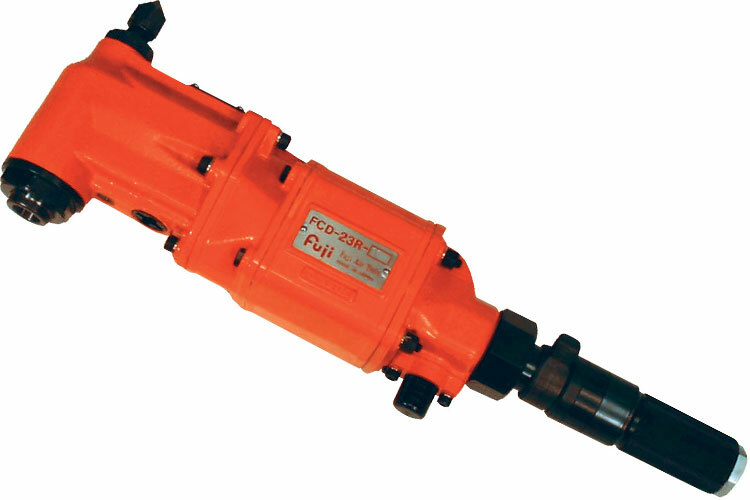 The 5412052515 Fuji NPT FCD-32R-11S Heavy Duty Corner Drill (Reversible) is one of thousands of quality tooling products available from MRO Tools. Please browse Fuji Heavy Duty Corner Drills (Reversible) for tools similar to the 5412052515 Fuji NPT FCD-32R-11S Heavy Duty Corner Drill (Reversible). 5412052515 Fuji NPT FCD-32R-11S Heavy Duty Corner Drill (Reversible) description summary: Model: FCD-32R-11S N Handle: Self Return Type (S) Drilling Capacity: 32mm/ 1 1/4'' Reaming Tapping: 32mm/ 1 1/4'' Stall Torque: 177(N.m)/ 130(ft.lb) Free Speed: 350min-¹ Socket: 3(M.T#) Side to Center: 35mm/ 1 3/8'' Feed Length: 53mm/ 1.38'' Quantity discounts may be available for the 5412052515 Fuji NPT FCD-32R-11S Heavy Duty Corner Drill (Reversible). Please contact MRO Tools for details.